YES! I'm ready to benefit more 5 star reviews online, receive an increased flow of leads and new customers compared to my competitors and convert more prospects that come to my website! If RepBuilder doesn't help me get more 5 star reviews online within 30 days... then I understand that I will receive a full refund, No Questions Asked! 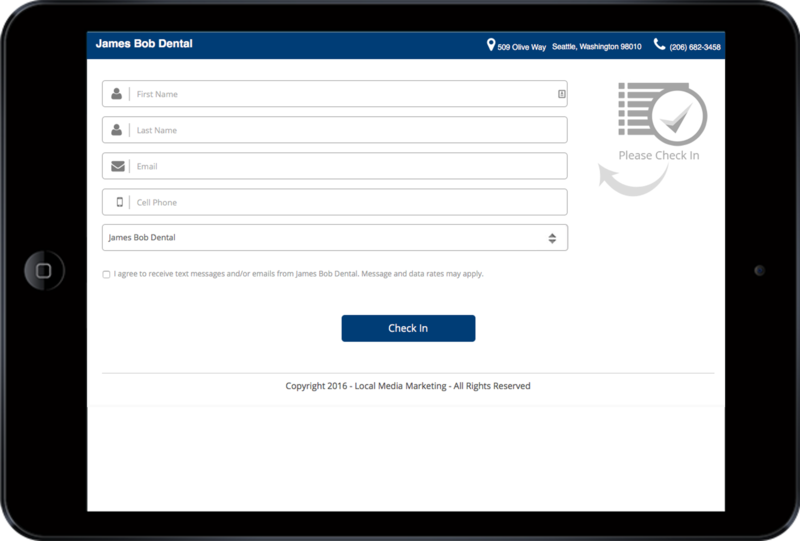 Just enter the Customer's name, mobile number and email address into the simple QuickAdd form at the end of the service delivery. This kicks off a predefined process for requesting internal (not-public feedback. The process can accommodate instant requests or delayed requests so you can make it suit your internal process. You can also add the location, service vehicle or service persons details. 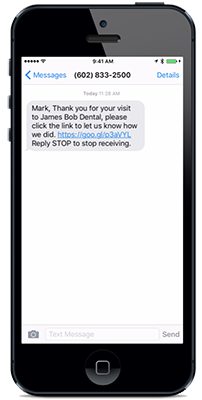 When the specified delay is completed RepBuilder will automatically send an SMS or email message to your customer asking for feedback​. SMS has much higher open and completion rates then email. 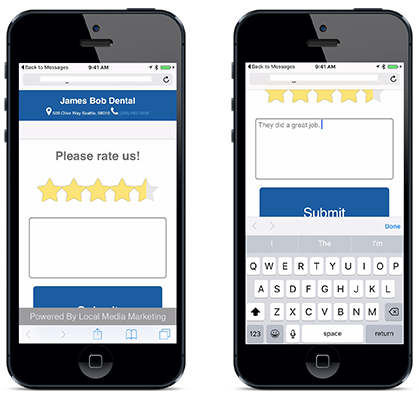 It's very easy for the customer to rate your service and leave feedback on their phone. It's even easier to do this on a tablet or desktop computer if they open the request by email. 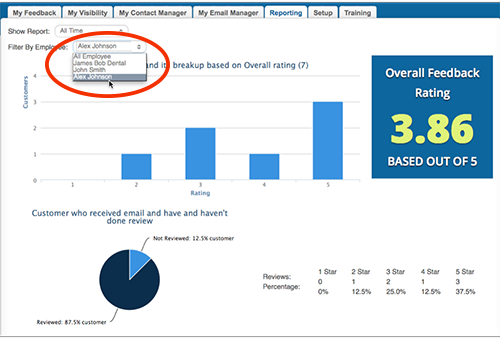 The is also the option to use the 0-10 Net Promoter scale and a simple Good / Bad service option is also available. All forms are mobile responsive​. Of course, people are busy and some don't leave feedback when you ask. RepBuilder has a fully customisable process for request follow up for those who do not leave internal feedback. 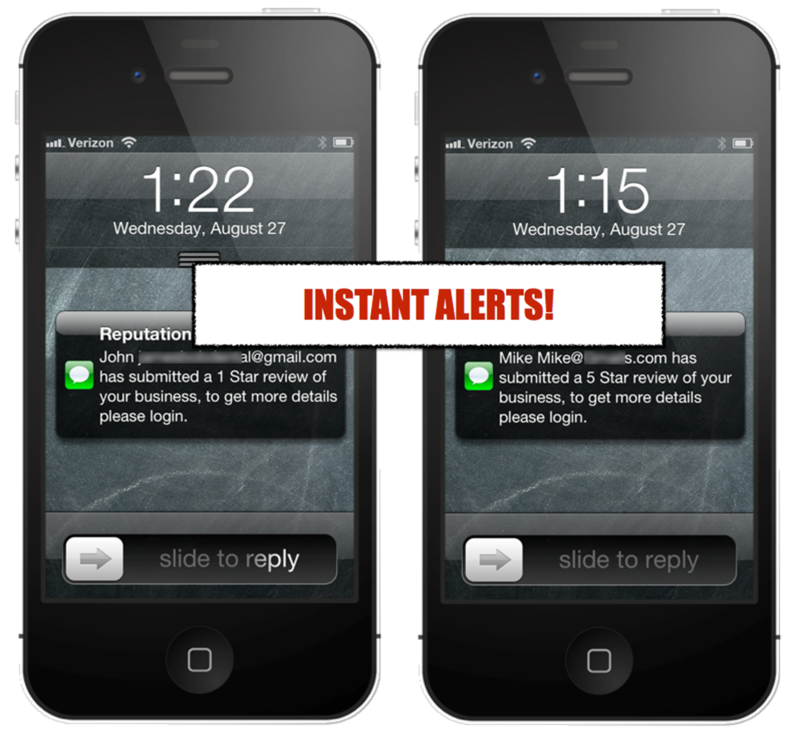 You can ask only once, you can ask a 2nd time, or you can send multiple reminders and vary the request delay. It's up to you. RepBuilder treats good reviews differently than bad reviews. When a customer leaves a positive review, RepBuilder can ask them to go online and leave a review there too. You can set follow up requests for online reviews as well. For people who leave a negative review, RepBuilder offers them different process. Customers who have given a negative review are not offered the chance to go online and leave an online review. 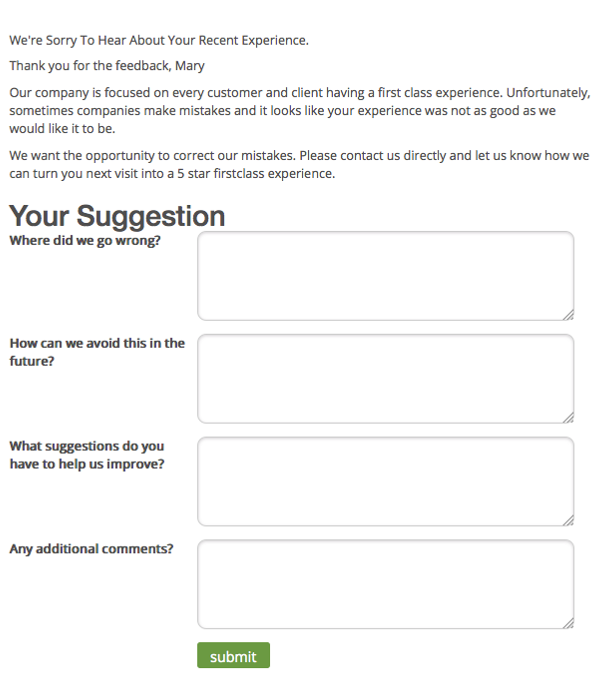 In the odd case where an unhappy customer leaves a negative review, RepBuilder directs them to a suggestion form so you can collect the rating and some feedback. This form can be customised for your business. 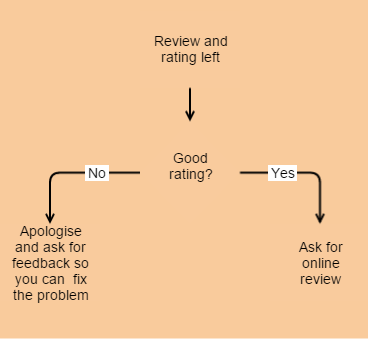 When someone has had a chance to have a say, they are less likely to go online and "take revenge" by leaving a negative review on one of the online review sites. It also puts your business in a position to fix the problem quickly and redeem the situation with your customer. When you get feedback from your customer, RepBuilder will automatically send a thank you response to the customer. RebBuilder also has a process for alerting a nominated person in your business about the feedback. You can set up a range of review sites to suit your business needs. 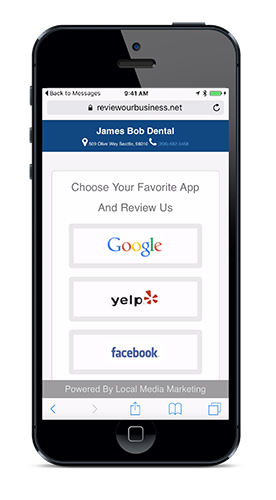 This allows you to direct customers to review sites that matter most to your business. Most people who have an Android phone have a Google account, so it's very easy for them to leave a Google review without having to log in or set up a Google account. You can also​ change the review site venues from time to time to make sure your business has new fresh reviews on a wide range of important sites. Your online reputation and reviews. It's also your easy to use link to responding to reviews and customer comments. If your business has more than one service delivery unit (vehicle, office, individual staff etc) you can even collect reviews and report on these at the service unit (or staff member) level. This can help you recognise, reward and retain those service teams or staff who deliver the best customer service to your customers​. 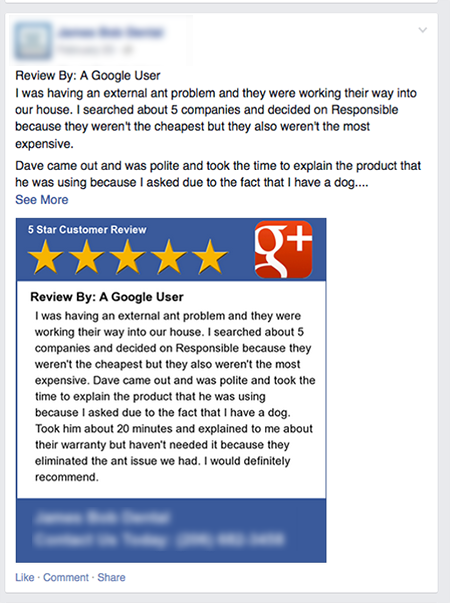 Shows a Google+ review shared on Facebook. Reviews and testimonials increase sales conversion by up to 200%. RepBuilder Plus allows you to include your great reviews and testimonials on your website. Infact, you can set them up so they automatically stream to the site. You have control over which reviews are shown, so you can ​make sure that your prospective customers will see all the positive feedback, ratings and reviews you have earned in one location. You can also share your positive reviews to a range of social media sites to promote your great reputation to prospective and existing customers on your social media properties​. This will help bring you new customers. RepBuilder is a complete review system. You can collect internal reviews only or you can get the good reviews online to review venues that matter to your business. 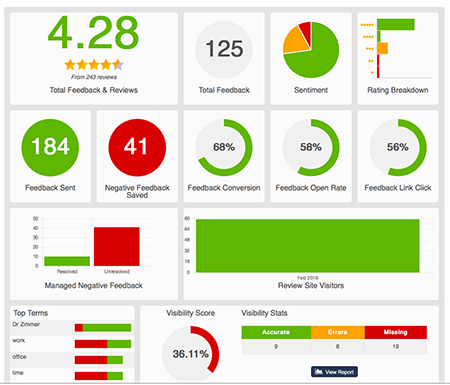 Easily manage your response to reviews and track performance over time​ at whatever level you want. What's Your Great Online Reputation Worth? *If using SMS / Txt options, there will be additional charges for the cost of the SMS service if more than 100 texts are sent in the calendar month.